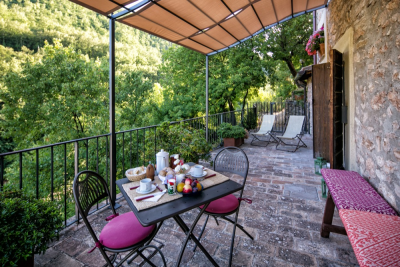 Positioned at the heart of a nine-hectare olive grove on the slopes of Mount Subasio, just 3 kms from Assisi, Villa Rosy is an enchanting Umbrian villa with private pool, the ideal setting for a large family or group of friends who love nature and relaxation but do not wish to compromise on confort. The Villa can accommodate up to 13 people and it can be rented in full or only a portion of it. 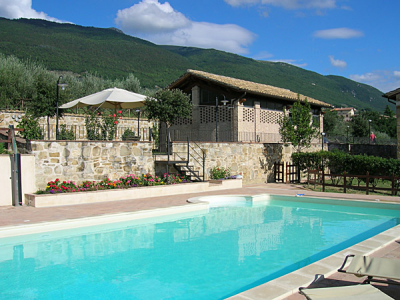 Residence Menotre is the perfect residence for a romantic holiday in Umbria. Surrounded by hills and nature, the fifteenth-century tower that houses Residence Menotre vibrates with all the history of the village of Rasiglia, near Foligno, where it is located. The tower is of historic interest and may be rented in full, with the advantage of three independent apartments (Corinna, Ilaria and Micol).